Gordie Howe is a hockey legend. Over the span of his career, the Detroit Red Wings icon dominated the ice, set records and earned the nickname "Mr. Hockey." Even today, the Sports Hall of Fame inductee still ranks as the third best NHL player of all time. 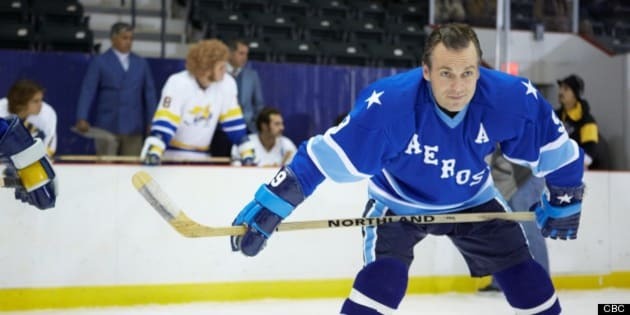 Now, CBC’s "Mr. Hockey: The Gordie Howe Story" depicts a retired Howe’s (played by "Stargate SG-1's" Michael Shanks) return to the ice in the 1970s, to once again play pro hockey alongside his two eldest sons and the impact it has on his family. After wrapping up filming for the day on his current TV series, "Saving Hope", Shanks spoke by phone about embodying the beloved Howe and his love of hockey. Hockey was your first love, even before acting. What about this sport ignites such fire and passion? I don’t know. It’s hard to say. Because I started appreciating it so young, it’s in your bones and body. You understand the emotions associated with it because you know the game so implicitly that sometimes it feels like you are playing it. When your team is losing or something gets you emotionally charged up, it’s like you want to jump on the ice. I’m sure a lot of people feel that same way in this country. I still get worked up from watching it. Did you aggressively pursue the Gordie Howe role then? Because I knew Andy Mikita and Malcolm MacRury, who I’ve worked with — and I’m working with Malcolm right now — were associated with it, I didn’t want to bug them. When you work with people, especially when [you] get to know them and become friends, you don’t want to be pushy with them. The movie takes place in the 1970s. What was so noteworthy about that period in Howe’s life? Anyone who has grown up competing to that level from a young age, especially in sports, you devote so much of your life and passion to it that when you retire, you’re still relatively a young man by life standards. By sport standards, you’re a bit older. You still have so much of your life to live. You’ve given everything you have to the sport, so you don’t know too much else. That was the significant thing. He tried the retirement thing and it wasn’t doing it for him. He still had this passion to play the game and he still thought he could. He harboured this dream to play with his sons and once he saw the opportunity there, he wanted to jump on it. He and his wife, Colleen (played by Kathleen Robertson) pursued that avenue. When you received the script, did you learn anything about Howe that surprised you? Most things did. I didn’t know too much about Gordie. When I was young and learning to appreciate hockey, Gordie was in the WHA (World Hockey Association). Where I lived, we had two channels, so I didn’t get a lot of chances to watch WHA hockey. My earliest memories of Gordie were when he was playing with his sons for the Hartford Whalers in the late ‘70s, early ‘80s. So, I didn’t know much about him other than the legend, his stats and records. In terms of his life, I had to learn everything from the ground up, from his personality and how he spoke. I pretty much had to do a 101 in Gordie. Everything about this particular time period, this particular story about his interactions with ex-Wings owner Bruce Norris to his injuries to his relationship with his family and sons and wife, I had to learn. Were you happy this movie explores the family angle instead of only Howe’s career? I think it’s very interesting, especially for an overall movie, that there’s so many intriguing aspects to the story. You just don’t get to see Gordie and his career. It spans this breadth of time that would take a lot bigger story or we’d skip a lot more points throughout it. This way, you get to focus on this time period and the things that were important to Gordie, which were his family. And you get to see him in this environment that as much as it was everything he loved, at this particular time period, it was also something he was unfamiliar with. Being at home and being a family man was a foreign concept to him a lot of the times. He discovered things about his family that he didn’t know, too. We talk so much about him and his older sons and how he played with them, we sometimes forget that his daughter, Cathy, got a little bit left out. Or sometimes Murray was kind of an afterthought because he was the youngest. Certain things happened to be sacrificed. As much as I love the playing and doing the hockey scenes and focusing on that aspect, I also realize, too, there’s a tremendous story there still to tell. There’s 25 years of a legend’s career to be mined for some other movie. Before pre-production, how competent of a skater were you? Had you hit the ice recently? I gave up a lot of my extracurricular activities and hockey was one of them. I was playing hockey with my son, who just started in the last couple of years. I was skating with him, but I wasn’t playing competitively. When I found out about this, I immediately called up Ivan Bartok, who did behind-the-scenes stuff for our Stargate DVDs. He still plays regularly. I called him up and said, ‘Dude, I need to get back on the ice.’ He said, ‘Follow me to the promised land.’ I also put rollerblades back on and was all over Vancouver, just getting back to skating. You’ve always been fit and in good shape, but Howe had a different build than you. Physically, how did you prepare for this part? When I talked to Andy, he was like, ‘You know, you really have to focus on doing some weights and more upper body stuff.’ One of the attributes Howe is revered for was his sloping shoulders and large upper body strength. That’s how he handled himself so well. I had five weeks to prepare, so I did what I could in that regard to get a little bigger up top. I’m about 170 pounds and Howe is about 205, so I certainly didn’t gain the weight I would have liked to, but I got a little bigger on top. Hockey players come home with bruises, broken bones or missing teeth. Howe fractured his skull early on in his career. Do you have any “battle scars” from filming this project? I didn’t get any making it, but what was funny about it is I had all these war wounds that over the years makeup artists worked really hard to cover up. They’d go, ‘Where did you get these from?’ ‘Oh, I got this from hockey.’ I have two scars above my right eyes and a chipped front tooth. My nose has been broken, so on camera, I have two different profiles. What was great is they could accentuate those. They sort of shaved into my eye brown to reveal the scars. I didn’t have to be self-conscious about my broken nose. They actually had to add a few scars to my face, too. So, I actually got to reveal some of my earlier hockey wounds that I couldn’t show before. Did you ever get to talk or meet Gordie Howe? I never did. I was hoping at some point in the promotion of the film that I would get to do that. I know he’s coming [to Toronto] for a personal appearance in August, so I’m planning on meeting him then. But, I don’t think the family was aware of the film. Mark and Marty [Howe] are listed as producers and had sort of a say in the goings on, but Gordie is mostly keeping to himself. With his condition right now, I think the family keeps him out of the public eye in terms of interview or appearances or me bothering him. At a certain point, I realized I didn’t want to talk to him because I didn’t want to add that pressure to what I was doing or the expectations. I didn’t want to have to feel like I was going to disappoint him if I was going to portray him in a certain way that was part of the script. I wanted to keep that at arm’s length and make sure this was an artistic portrayal, as opposed to being pressured to do it exactly right. Howe accomplished a lot. Were his philosophy and determination inspiring? When you look at yourself sometimes, and I still consider myself young in my own brain somewhere, and you go, ‘Geez, I’m 42 this year and that’s the year Gordie retired.’ He retired when he was 42 and went back when he was 45. You sort of go, ‘What would it be like to have to give up what you love to do and have to prove it to yourself again?’ That was a big part of the movie, was him having to prove to himself that he could do it and fight his own pride at times and how his pride got in the way of his intentions with his family sometimes. The will and determination to prove to yourself, and to prove to everyone else, that you can still do it…As we get older, we get wiser, but sometimes we get a little bit more of a chip on our shoulder when it comes to people telling us we can’t do something. That was a big part of this movie. And that was something he taught me, that you can still do it. He not only went back and played when he was 45, he played until he was 52-years-old. He’s quite an inspiration for all us folks getting up in the tick tocks. To end on a fun note, what are your go-to hockey movies? Everybody will tell you “Slap Shot”. That’s the ultimate hockey movie. I have to list that in the top two. I’d say my favourite overall hockey movie, just because of the caliber of the hockey, is ,strangely enough, “Miracle.” It’s the best pure hockey movie about hockey, with the best skating in it and the one that shows the sport off really well. What’s amazing is you look at it and go, ‘Wow, of all the hockey movies, an American story is one of the best hockey movies going.’ But, it was also filmed in Vancouver, which I find ironic somehow. "Mr Hockey: The Gordie Howe Story" airs Sunday, April 28 at 8 p.m. on CBC TV.